While reading my latest issue of the Birdwatchers Digest, I came across and interesting note about a recent study of the behavior Alpine Swifts that was published in 2013. It was published in the Nature Communications. 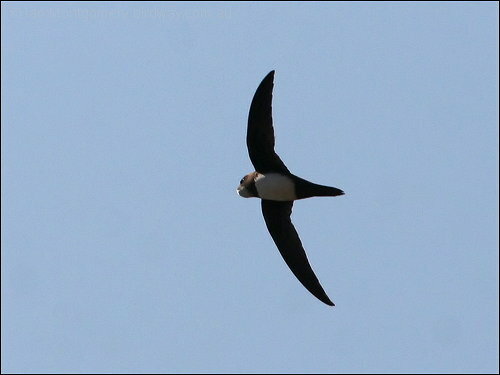 After analyzing data, they found that “the swifts appear to fly nonstop when they aren’t breeding. (The swifts eat insects in mid-air, of course, so they don’t starve.) The actual time totals up to a phenomenal 200 days aloft.” (BWD) This posses another question. Do the Swifts actually sleep on the wing? There were indications that this was happening. The articles go on, but I find this truly amazing. Our Creator used such Wisdom when He made these Swifts. Not only are they able to eat on the wing, but also catch a nap. Wow! This entry was posted in Bible Birds, Birds of the Bible and tagged Alpine Swift, Apodidae, Bible, Birds, Birdwatching, Christian, Creation, Half-asleep, Home School, Nature. Bookmark the permalink.